Nikonians Academy Director Mike Hagen invites us to check out one of the latest results from the partnership between the Academy and CreativeLive. A CreativeLive blog by Justin Katz titled Back Button Focus Will Change the Way You Use Your Camera includes video workshop amplification by Mike. With over 20,000 views already, this teamwork approach to a complicated topic is helping many photographers improve their techniques. For more about mastering autofocus on Nikon cameras, be sure to watch Mike's CreativeLive workshop titled Using the Nikon Autofocus System. This is an often-overlooked function of your digital SLR. In this workshop Mike Hagen helps you understand how to configure your camera's autofocus system for portraits, sports, wildlife, and landscapes. Relying on autofocus will also let you concentrate on lighting and composition, and help you take advantage of those fleeting moments. September is a busy month for three of our Nikonians Academy instructors. Steve Simon is running his sold-out workshop Cuba - The Passionate Street Photographer. This intimate six-day masterclass (limited to 10 students) will take attendees to some of the most picturesque, interesting and exciting locations on and off the beaten path in Havana and beyond. "Everything will be taken care of for you so we can concentrate on making amazing images of the people and the culture in Havana. We will explore vibrant, visually rich places and neighborhoods in Old Havana, often outside tourist areas for unique photo opportunities. We will have great access at a local outdoor boxing club with great light-a place where some of Cuba's best known boxers have trained. We will visit and photograph the National Ballet & Dance Company. Old Havana is spectacular at night and we will go out night shooting as well. With the recent warming of diplomatic relations between the United States and Cuba, change is inevitable making now a perfect time to visit." 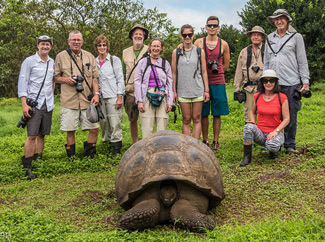 Mike Hagen leaves for Galapagos on September 17 with 9 intrepid photographers to shoot stunning pics of wildlife from their chartered yacht. There are some seats still available (and going fast). "An early 6:00am breakfast followed by the first shore excursion. We return for lunch followed by a siesta while the vessel navigates to the next island. Mid-afternoon, we disembark for the second excursion and return to the boat by sunset. Before dinner, we hold a briefing for the next day's shore excursions. In the evenings, we motor to the next island arriving early in the morning for a new adventure." 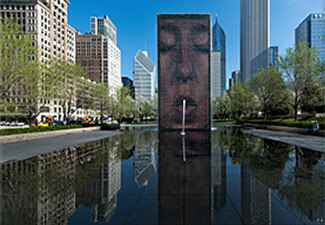 Rick Hulbert is running his top-notch Urban and Street Photography Workshop in Chicago, Illinois September 22-25. Rick still has a few seats available for the September workshop, so don't delay if you want to attend. There are accepted principles for photographing buildings and other man-made structures. Knowing these principles will make you a better photographer. Understanding the science and art behind these principles will allow you to learn how to "break rules" in a deliberate, meaningful way. You will learn how a basic understanding of Street Photography will assist in your architectural and urban photography. "Our workshops and trips are an incredible amount of fun. Our participants always learn practical skills, have a wonderful time, and come home thousands of beautiful images. We've already begun adding new workshops for the remainder of 2016 and 2017. Join us in Africa, Utah, Hungary, Italy and much more." Nikonians Academy Director Mike Hagen has three updates this week. The first points to one of our most popular workshop series, hosted by Rick Hulbert. The second spotlights your opportunity to join Mike at one of the ideal locations for photographing elephants in Africa. The third update highlights online classes available to the community through our partnership with CreativeLive. We have one month to go until Rick Hulbert's Chicago Urban and Street Photography Workshop. Rick is one of our Academy success stories and does such a wonderful job on his workshops. He's thought through all the details for this workshop and has created a curriculum that's truly one of the best in the world. 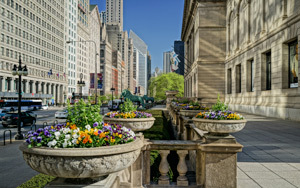 Join Rick in Chicago next month for an enlightening class that will help you better see and photograph the urban landscape. Tanzania's elephant population is one of the more robust in the world. One of the best places to photograph these giants is in Tarangire National Park. Mike Hagen has designed this November's photo safari to take full advantage of the park in order to maximize elephant photography. 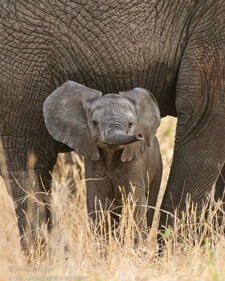 "Tarangire is one of my favorite places to photograph elephants. Here, you are able to compose herds of elephants against giant acacia trees, babies interacting with their mothers, all from just a few meters away." One of the best aspects of this trip is that we are only allowing three photographers per vehicle. This means that each person will have an entire row to themselves with one seat for their camera gear and the other seat for themselves. There will be plenty of room to move around and everyone will have perfect access to all photo opportunities. Join Mike on this year's safari (November 4-15, 2016). Nikonians Academy Director Mike Hagen tells us the Instructors Rick Hulbert and Steve Simon are all set for their upcoming workshops. Rick Hulbert's Urban and Street Photography Workshop in Chicago starts September 22nd. The four-day session includes plenty of field photography exercises followed by constructive critiques. Rick's education philosophy is all about photography for smarties. He feels strongly that photographers want to be treated with respect and that he should build on their existing knowledge. Rick mixes classroom lectures with field photography and image reviews to teach attendees how to photograph the urban environment. This class is truly great and routinely garners some of the highest feedback from students. "Just finished the Chicago Urban and Street Photography Workshop with Rick Hulbert - Fantastic! I learned a ton and had a great time. Rick is a fabulous teacher, photographer and Architect. He really knows his stuff and isn't shy about sharing his experience and knowledge. Well worth the money as I walked out of the workshop feeling as though I'm headed to the next level as opposed to walking out the workshop with a few good images but haven't learned much." We are three weeks away from Steve Simon's Passionate Street Photographer workshop in Cuba. The workshop begins on September 9th. We have just enough space for one or two of you to squeak in under the wire. Contact us immediately if interested. 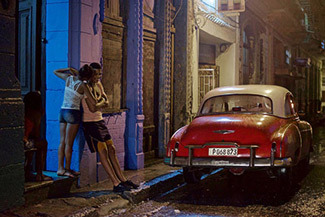 The neat thing about this workshop is that Steve combines teaching from his best-selling book, The Passionate Photographer, with the real-world street scenes of Havana. Every day is an adventure on this trip. This intimate six-day masterclass (limited to 10 students) will take you to some of the most picturesque, interesting and exciting locations on and off the beaten path in Havana and beyond. Steve will be teaching you new and powerful street photography techniques guaranteed to push you from your comfort zone to new heights in your work and share his street-shooting philosophies gleaned from a lifetime of wandering urban places with his camera. This intensive workshop will help you find your own unique vision and street style through assignments created to get you past photographic fears and clichés to capturing lyrical, poetic and decisive moments that communicate the energy of the streets. 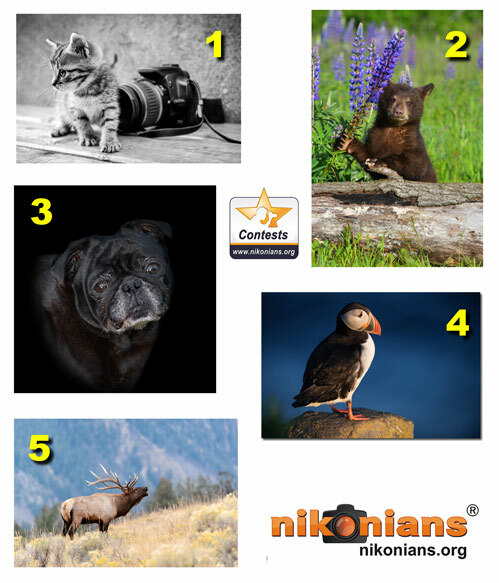 Nikonians Photo Contest Director David Summers (dm1dave) has posted the winner and honorable mentions from Segment Two of our Best of Nikonians Photo Contest. The segment theme was Animals. Our winner is Leb Annamaria-annie (annie_j) from Romania, with her image titled My Little Assistant. Her photo of a kitten in front of a Canon camera was taken with her Nikon D40. 1. Winner - "My little assistant" by Leb Annamaria-annie (annie_j) from Romania. 2. Honorable mention -" Black Bear Cub In Meadow" by Mark Morrison (Lunastar) from Minnesota, USA. 3. Honorable mention - "Otis My Black Pug Dog" by Candi Foltz (CandisCamera) from Florida, USA. 4. Honorable mention -" Puffin against the sea" by Henning Bossen (henbo) from Denmark. 5. Honorable mention - "Bugling Elk" by Pete Wilson from Michigan, USA.